I have been reading in Creating Keepsakes and on the Fiskateers blog about how having things easily accessable and "pretty" help creativity and just makes your work-space a little more enjoyable. Well in my case my work-space is my dining room. I just try to keep it out of the way of food and the kids messes! But after reading those things I decided to try a little bit of sprucing up! I went to Goodwill and found an ugly jar. I figured if I painted and added a little cricut, it could be cute! 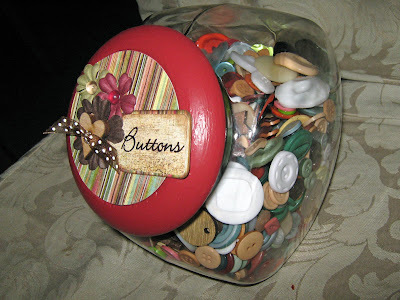 So here is my new found home for my buttons. Not too bad for .99! (I am all about a bargin!) 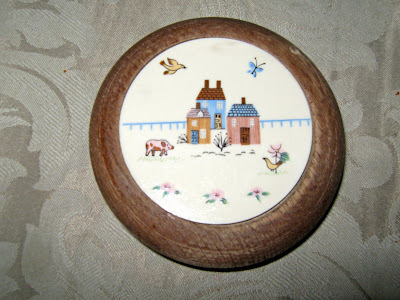 The last picture is of the orignal jar lid. I used paint that I used to paint my dining room chairs and the paper is from BASICGREY (which I love!). The small flowers are from prima with skittles in the middle and the big flower is a Bazzill flower. 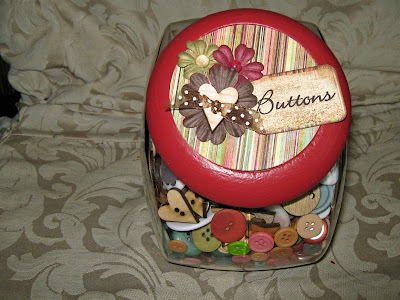 The button is a wooden heart that I got at JoAnns. The tag is from George and I made a rub-on for the word Buttons. I Love it! 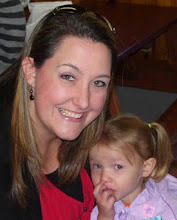 I love everything about your blog! Good job.